Improve your visibility with search engines so you show up higher in search results. Get inbound leads fast with Google AdWords and other PPC services. Turn visitors into customers with a conversion-oriented, mobile-friendly website. Develop an attention-getting social presence that earns customer trust and boosts sales. 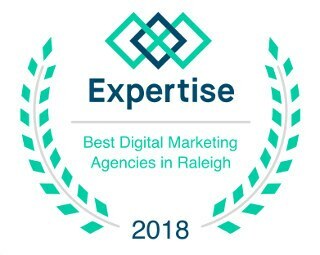 As your Raleigh SEO company we’ll boost your website’s visibility with search engines so you shop up higher in organic searches and connect with more local customers. We special in Local SEO, helping small local businesses stand out from the crowd and can help you optimize your website, backlinks, online content, and Google maps listing so it all works together for best results. If you follow outdated practices or don’t pull all of the pieces together, your SEO may not only be ineffective, but it could even get you penalized or de-indexed entirely. SEO is a technical service in which we optimize on-page website factors such as your page load speed, silo structure, headers and meta tags, and more, as well as your off-page factors such as your backlink profile, anchor text ratio, social media activity, and online content profile so that your brand as a whole is optimized for search engines. SEO crosses over into website design because the written text itself as well as the order and placement of items on a page can affect search results, as well as the overall website architecture. If you need inbound leads fast, Google AdWords and similar paid services are a terrific solution because they can start bringing you more inbound leads in as little as 24 hours. Google saves the top part of the screen for these paid ads, so if you aren’t there then you’re missing out on a lot of traffic. If you have an existing ad campaign, you could be losing money if your search terms and negative keywords aren’t set up properly since you might be paying for the wrong kind of clicks. For example, if your business is auto repair, you probably wouldn’t want to pay for clicks from people searching for auto parts. The right AdWords campaign structure and ad-content is crucial to realizing a positive ROI on paid search advertising. We can help you optimize your AdWords campaign, as well as making sure that the website page that people are sent to is actually designed to give the best chances of them contacting you for service. Many people overlook landing page optimization but it’s a critical piece of the puzzle; don’t leave money on the table by sending people to a page that was never designed for conversion. Your website is the hub of your company’s online brand and should represent your business professionally. Your website should be a digital asset that makes you money by converting visitors into leads. Whether you don’t have a website at all or simply aren’t getting the kind of results you need, we can help you implement an effective responsive-design website that works for phone, tablets and PC’s, designed in accordance with principles of neuroscience research into specific website design principles that affect conversion. Your website is the single most critical factor in your SEO, too, so you want to pick a company to implement it with the SEO services to optimize it. It can be tempting to want to put the same things on your website that you see a lot of other people doing, but unfortunately that doesn’t necessarily boost your revenue. Your website is a tool that should help create trust with potential customers, provide value, demonstrate your capabilities and professionalism, and convert your visitor into an active lead. Contact us if you want to get more results out of your website. Are you on social media? Your customers are, and they’re making decisions about who to buy from based on what they do and don’t see online. If you aren’t on Twitter, Facebook, and other key platforms, you’re missing out on a huge opportunity to connect with potential customers and build trust that increases lifetime customer value. Social media can be fast and easy when you have the right tools – our cutting-edge portal makes it a snap to keep up with social activity on key platforms as well as monitor your online reputation. We even have complete done-for-you solutions. Social media has never been this easy! Being found across multiple platforms can also demonstrate the strength of your brand. Our content marketing services can help get the word out about your business across the web while creating powerful trust signals with Google and other search engines. As a US military veteran myself, I believe in supporting those who risk their lives for our freedom. I offer special services to US military veterans that have separated from the military within the last 12 months. Once a quarter, I do one basic installation absolutely free if you qualify and enroll in managed services. Limitations apply and not everyone will qualify so contact us for details.